So Many Stamps So Little Time: Lots Of Fun Stuff Today! This is a HUGE post today with lots of pictures, more then my usual for sure. Today I am entering a Stampin' Up! demonstrator only contest. The winners will receive product to create projects for the sample boards at the SU convention in June. How fun would that be?! 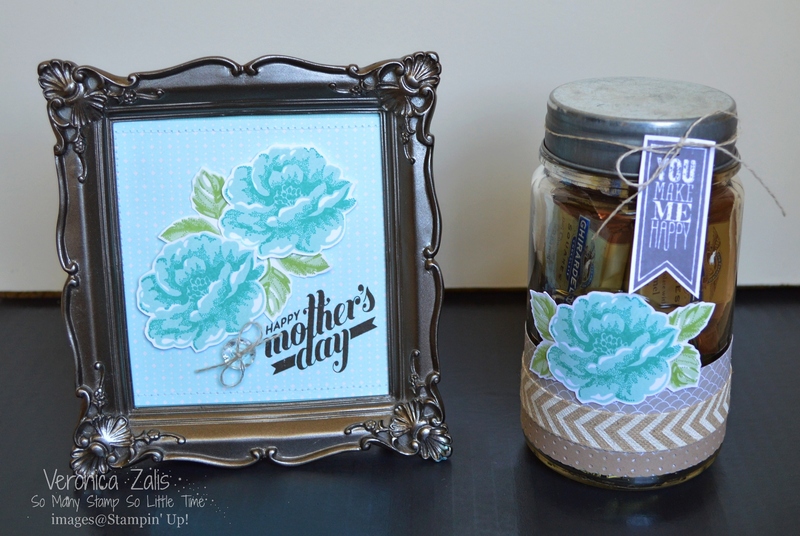 The challenge was to create 6 projects; 3 cards, 2 3D items, and a scrapbook page. Lets get started shall we? 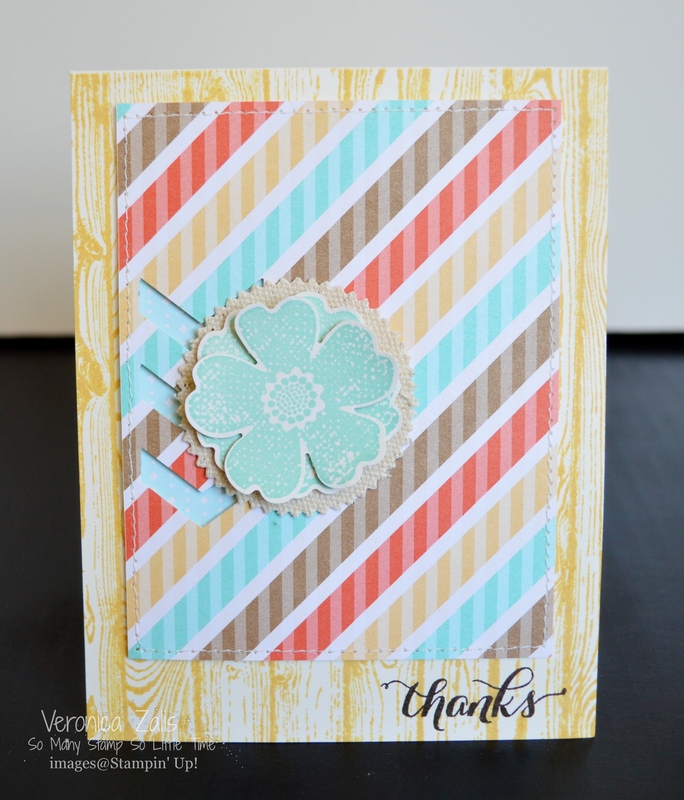 My first card featured above uses my favorite DSP collection from the Occasions catalog, Retro Fresh. I added a panel stamped with the Hardwood background stamp and So Saffron ink. I added punched flowers using the Flower Shop (On the retired list so ya better grab it while you can!) stamp set and punch. The flowers were stamped in Tangerine Tango ink. I added a sentiment from the SU photopolymer set Many Thanks. My next card used the same supplies, only a different design and stamped sentiment. I added a piece of linen that was in the SAB banner kit, and die-cut it with a die from the Starburst collection. 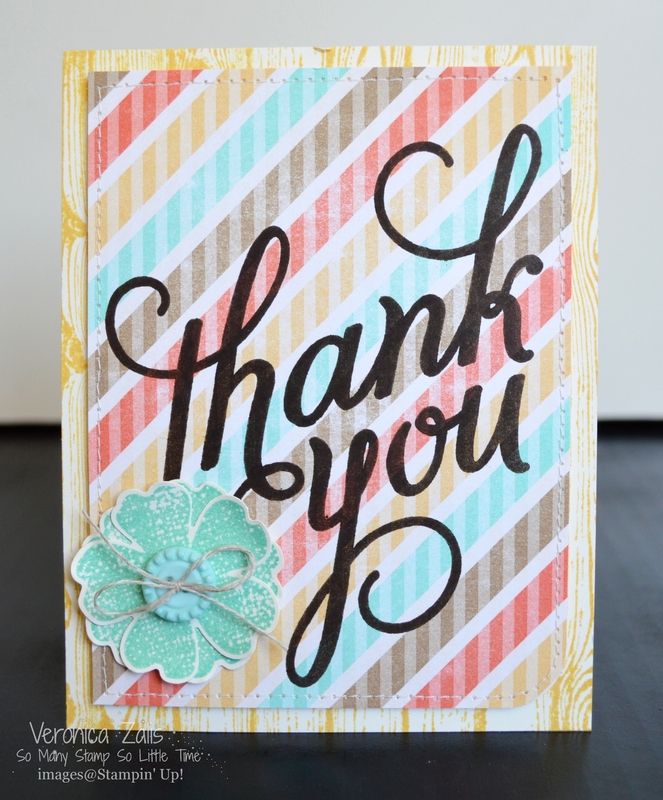 I also used the Chevron border punch (love) to add dimension to my top layer. My third card is my favorite! I distressed my DSP with a sanding block before stamping the sentiment. I used Early Espresso classic ink to achieve the solid, perfect stamping. Next up are my 3D items. I created a Mother's Day gift set featuring Stippled Blossoms, and the new, and awesome photopolymer stamps in the April Paper Pumpkin kit! The tag on my jar of yummy chocolate goodness was stamped using the Perfect Pennants stamp set, and Basic Gray classic ink. Finally the project that took me the longest, a 12x12 scrapbook page featuring my precocious 3 year old Connor. I added so many fun embellishments, and stitching to this page. I used my sewing machine, and I hand stitched the criss-cross pattern beneath my photo. The only thing I would change about this page is my handwriting! Oh well, I'm happy I wrote down a memory, and as far as I can tell it is legible, so I guess I can count this as a win no matter what happens, right? Thank you for sticking with me till the end. What was your favorite project shared today? Leave a comment for a chance to win some Stampin' Up! goodies! I love everything (SU!) I'm especially drawn to the flower frame for mother's day.... just gorgeous! Very cool. Love it all! You're a crafting machine, girl! Love all of them , but if I had to choose it would be the scrapbook followed by the pretty Mother's Day ensemble. These are all so wonderful! My favorite is the decorative glass jar! It's always fun to make and give away gifts that have a crafty touch! Thanks for sharing such great work! Wow! Tons of eye candy! I love everything! I love the retro fresh collection! Wow girl! All six projects are stunners!! You're so talented!! I love love LOVE the flower shop bundle! I so have to get it before it is gone. I honestly haven't liked any projects with the Retro Fresh pieces until I saw yours. For some reason the color palette just hasn't appealed to me but you've changed that! Excellent work! The flower show set is so cute! You utilized it very well.